Style and functionality in an affordable package. The Casio SR-S4000 electronic cash register is one of the latest additions to Casio’s ECR (electronic cash register) product line, and combines a remarkable feature set with a sophisticated design. The Casio SR-S4000 10-line LCD makes every transaction easy to read and easy to understand for the cashier, which reduces the chance for human error. The operator display is so large that it can accommodate up to five line items as well as the transaction subtotal and the price of last item entered. The SR-S4000 also boasts a two line alpha-numeric pop-up rear customer display which is detailed enough to show the customer the name of the last item entered, the price and the transaction subtotal all at the same time. 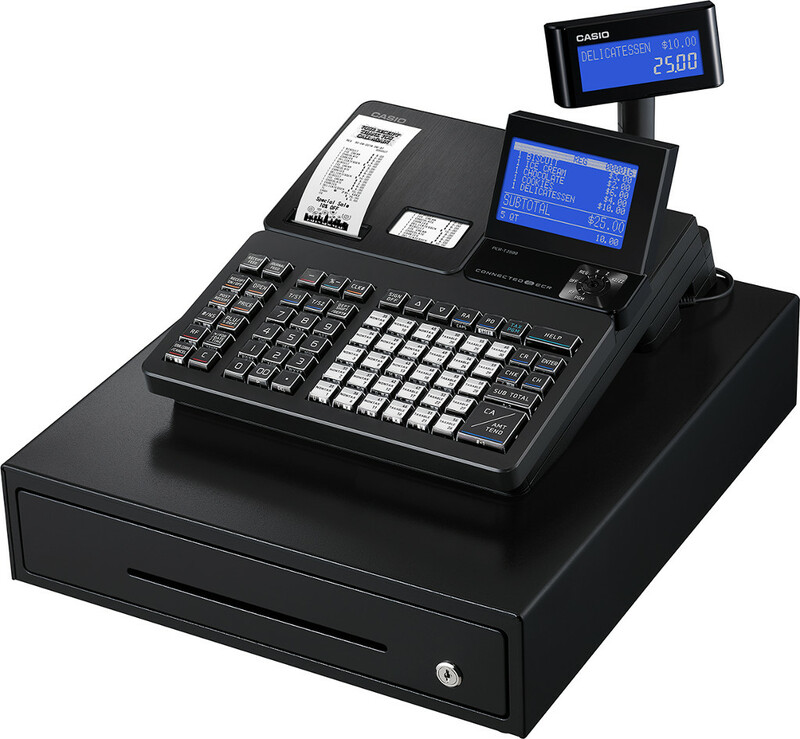 The Casio SR-S4000 cash register offers a generous keyboard with 30 “raised” department keys that can be pre-set priced or open to enter prices manually allowing retailers to categorize their sales. An optional scanner can be connected to one of the two Casio SR-S4000 serial ports, allowing up to 7,000 items to be scanned. The Casio SR-S4000 comes equipped with a two station thermal receipt printer that prints both a receipt for customers and a printed journal for the merchant’s records. The merchant may customize their receipts with a graphic logo and program messages for both the top and bottom of the receipt. The register also comes with a steel 5-slot cash drawer and coin tray, which is large enough to accommodate Canadian bills as well as one and two dollar coins. The Casio SR-S4000 is also compliant with HST and is capable of penny-rounding cash change in Canada. One of the most impressive features of the Casio SR series of cash registers is it’s Bluetooth connectivity! The SR-S4000 comes standard with Bluetooth (BLE Ver 4.1) communications for the purpose of linking up to smartphones running Casio’s Connect ECR+ application. The free Connect ECR + app provides retailers the ability to read and reset sales totals from the SR-S4000. The main dashboard on the Connect ECR + app gives a quick snap shot of the day’s sales activity and provides the sale results in graphical format. Viewing detailed individual reports (Financial, Transaction, Department, PLU, Cashier, Groups and Hourly) are also available to retailers to analyze the store’s performance. Connect ECR+ also offers the ability to transfer the daily sales activity to the cloud for the purpose of providing historical data to be viewed at anytime and anywhere with smartphone coverage. In addition to the sales activity features being available on the Casio smartphone app, programming the machine through Connect ECR+ is also possible through easy to understand screens. Integrated credit and debit is offered in Canada for the Casio SR-S4000 electronic cash register, and provided by Global Payment Systems. Integrated credit and debit streamlines transactions, reduces human error, and reduces the potential for fraud and theft. Integrated payments on your Casio cash register will also reduce the time it takes a merchant to reconcile transactions at the end of the day, because electronic payments tend to be penny accurate when used and setup correctly.